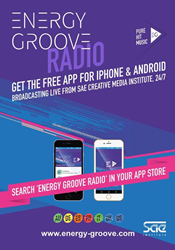 Energy Groove, an online commercial radio station with affiliates in Australia, Italy, Spain, France, Germany, and the U.K., has established a U.S. affiliate on the campus of Ex’pression College in Emeryville, CA, which is part of SAE Institute USA. Energy Groove U.S. will be run by Ex’pression students, and will present a wide range of talk, entertainment, and educational programming. Energy Groove’s studios are housed in SAE campuses around the world. The stations have grown from having 12,000 international listeners when they launched to now more than 5 million listeners. “Energy Groove offers a forum for Ex’pression students to apply their classroom experiences at a dynamic, real world media outlet that reaches millions of listeners around the globe." Energy Groove’s studios are housed in SAE campuses around the world. The stations have grown from having 12,000 international listeners when they launched in 2009 to their current audience of more than 5 million combined listeners. The on-air schedule in each Energy Groove territory includes live and pre-recorded music and mix shows, talk shows, and educational segments (including product reviews from key figures in the audio and film industries and news about audio/film industry innovations) that are entirely student created. There’s also shared programming from Energy Groove affiliates in other countries. Along with streaming on the web, Energy Groove is heard on the in-flight entertainment system across all 220 planes that fly the international routes of Emirates Airlines.